Being a vegetarian, I learned right away that without some protein in my diet, I would become extremely ravenous and eat anything and everything in the kitchen, but nothing would quite satiate me. If you go meat free, first off, me and the animals love you, but secondly, you’ve still got to get some form of protein in your diet. 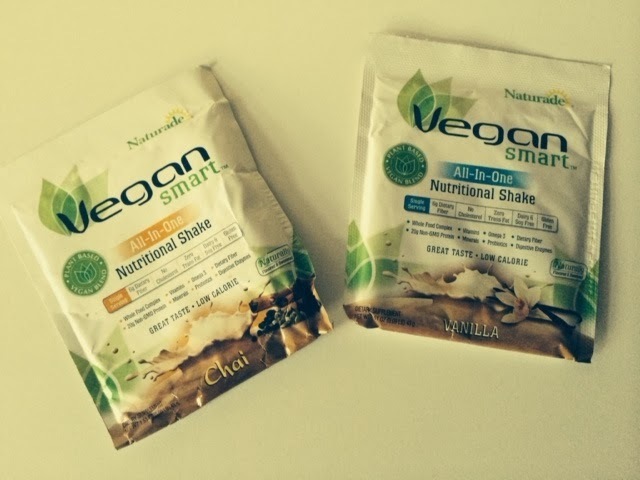 While there are lots of shakes out there still made of animal protein, if you are vegan or vegetarian, you can still find great options that don’t contain egg, dairy, or animal proteins. I’ve tried a few, and if you’ve ever had a vegan protein shake, they definitely have a bit of a different taste. Some brands will add lots of sugar to it to make it taste a little better, but if you’re heath conscious like I am, you certainly don’t want, or need, extra sugar. 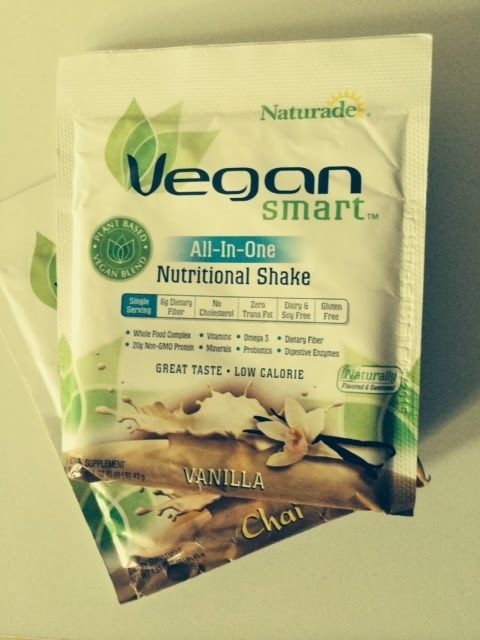 I was so excited to try out my Naturade Vegan Smart All in 1 Nutritional shakes, because they are vegan, obviously, and because they come in some really great flavors, like Chocolate, vanilla, and my favorite, chai! They also are super low in sugar! Most have only 5 or 6 grams of sugar per serving, which is really pretty amazing. I’m not the worlds biggest coffee drinker, in fact I mostly drink tea because I like the taste better and I’m a little caffeine sensitive. I can drink a few cups of tea and never get the jitters but too much coffee, and I’m shaking like there’s no tomorrow! I usually avoid coffee for this reason, so you can imagine how excited I was to find out about a great caffeine-free alternative that provides natural energy, has potassium and soluble fiber, is non-acidic, rich in insulin, is 75% organic. and is completely gluten free! I bet you didn’t know such a thing existed did you? It does! It’s called Teeccino! They have AMAZING coffee and teas that will make you feel like you just drank that cup of coffee, minus the jitters, and you’ll also get a lot of other health benefits! 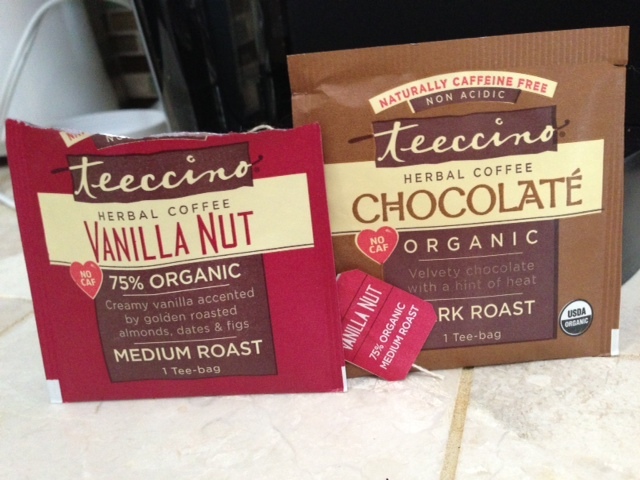 I was so excited to try out these delicious flavors Teeccino offers! I got the French Roast and Mocha coffee, but there are TONS of yummy flavors to choose from, both light and medium roasts! I absolutely loved these coffees! They are ground so I could use them in my Keurig, so I immediately loved that. 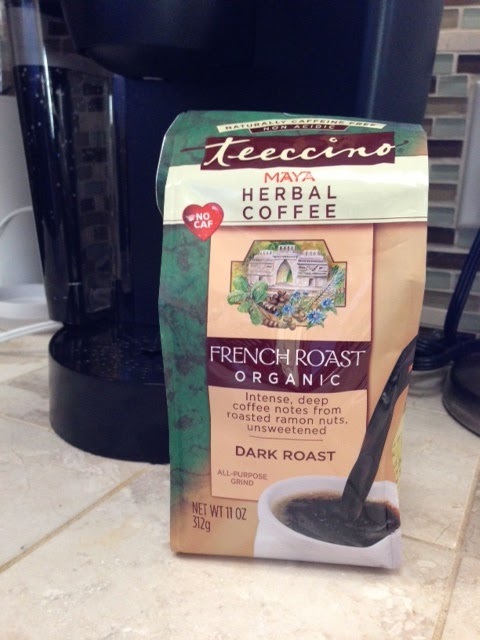 I’ve drank a cup almost every day since I got my Teeccino coffees, and absolutely love them! They taste amazing! The French Roast was my favorite but I really loved the Mocha as well. I just added a little bit of my Torani Hazelnut syrup and I was good to go! Best of all. no jitters whatsoever! I felt the energy a cup of coffee usually gives me but without the shakes! My caffeine addicted husband even drank them a few times and really liked the flavor and the boost of energy it gave him too! Next I tried these delicious hearbal coffee teas. They come in tea bags. I loved the taste especially the Hazelnut flavor. I added a little sweetener to my teas too since they can be a bit strong, especially if they’ve been sitting in your cup a while. I loved how easy they were to use and loved the natural energy they gave me as well! I highly recommend these coffees and teas to anyone who loves their hot morning drinks. They work for anyone since they have no caffeine but will still give you a boost of energy! I never needed more than one cup a day but loved that I could drink one really late in the day if I wanted. I wouldn’t dream of drinking a caffinated drink after 2 pm, because I know it would keep me up all night, but not my Teeccino! I can drink it anytime day or night and still be able to nod off with ease at bed time. Lastly, I got to try a couple different flavors of TeeChia cereal! Let me tell you, this is exactly what I’ve been looking for! I like my super high fiber, low sugar breakfast cereals and they are about impossible to find! Over the last year, I’ve been adding chia and flax seeds to my cereal so I LOVED that TeeChia comes with both, PLUS Quinoa for protein, Amaranth, Ramon, and Pumpkin seeds! How amazing is that?! These cereals are packing a serious super-healthy punch! The directions say to add something sweet to it like milk or stevia. I used plain water to mix with it (its kind of like oatmeal- the way it looks and its consistency) but then added some fresh or frozen berries to it and that was the perfect amount of sweetness for me! I loved how it tasted but I’m warning you, if you love sugary cereals, this will probably not suit you. 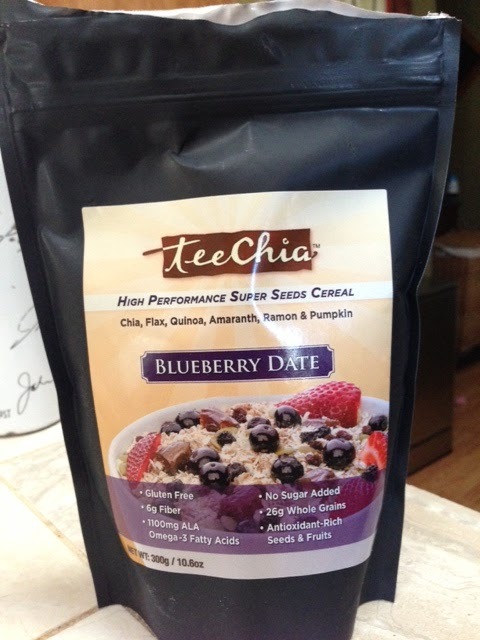 If you, like me, are looking for a super healthy, delicious, low in sugar cereal, that still tastes great, than TeeChia is it! The thing I loved most about this cereal was how full it kept me! I eat at like 7 am and am normally starving by noon, but I made it until almost 2 or 2:30 everyday before I started to feel hungry. I was totally amazed by that! I love that, because then I don’t feel like I’m snacking all day long. 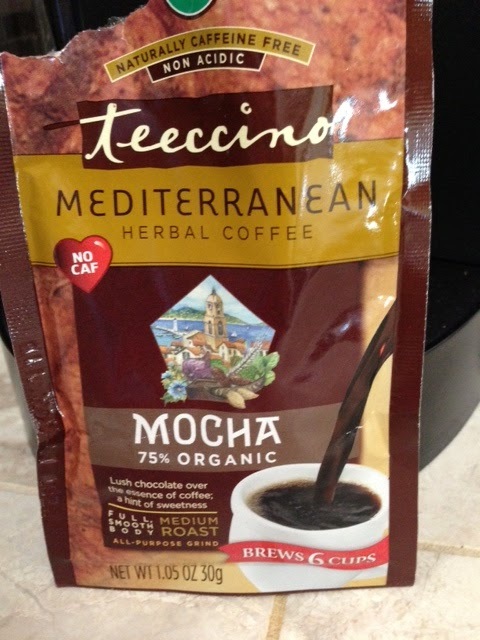 I ABSOLUTELY will continue to buy both Teeccino Natural Coffee and TeeChia cereals in the future! I’m so excited about both of them and absolutely love how heathy they both are and how great they taste, make me feel, and especially because they seem to make me eat less throughout the day! If you’re interested in learning more or picking up some for yourself (you won’t regret it!) 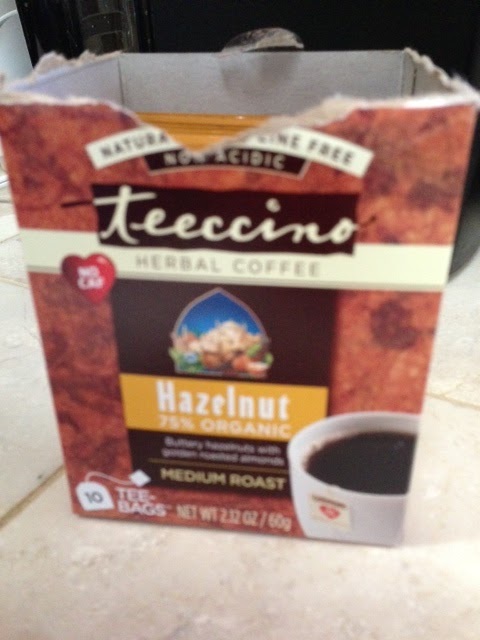 Check out Teeccino.com and TeeChia.com today! These products were given to me by NaturallySavvy.com but the thoughts and feelings expressed in this review are of my own opinion. I know I don’t normally review or really post anything other than fashion and beauty here, but I had to share this with my readers! I’m a huge fan of wine, especially cabernet, so when I saw these frozen wine cocktails by Arbor Mist, I couldn’t wait to try them. I love a nice frozen cocktail in the summer, but I never feel like I can find wine options, so I’m stuck with some super sugary drink to get that nice cooling sensation. Well problem solved! 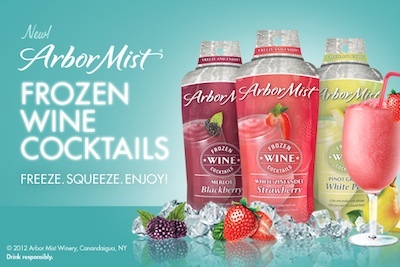 Arbor Mist has introduced this amazing frozen wine cocktail that comes in several different flavors! I got to try the Blackberry Merlot, Strawberry White Zinfandel, and White Pear Pinot Grigio thanks to She Speaks! I enjoyed them all but my favorites were a tie between the Blackberry Merlot and the Strawberry White Zinfandel! They are smooth, delicious, cooling, and actually a lot of fun to drink! These delicious frozen cocktails are super EASY and convenient! Just stick the packs in the freezer for at least 5 hours, then just rip open the top and empty into a glass! I used them at my house for a nice afternoon refresher and took them on my boat this weekend! I loved using them on my boat, because they were so easy to use, and so delicious and fabulous at cooling you off in the hot summer sun, and it totally made me feel like I was on a luxurious vacation! Overall, I REALLY enjoyed the frozen wine cocktails by Arbor Mist. They are the perfect summer treat, and I plan on keeping them stocked in my freezer for when guests come, or when I feel like having my own little luxurious vacation in the back yard! If you would like to learn more about this amazing product, check out ArborMist.com. Also be sure to check out SheSpeaks.com to join a fabulous community all about sharing and discussing the latest in all things related to Women!